Does My Rug Need Padding? Yes, all rugs need padding. When you walk on your rug, you do not want to move the foundation of the rug. Installing padding underneath your rug helps the rug not to move, and it helps preserve the quality of the knots in your rug, too. When a rug is installed without padding, its shape will distort over time. Your rug will lose its shape, be it rectangular or round, simply from being shifted and moved frequently. 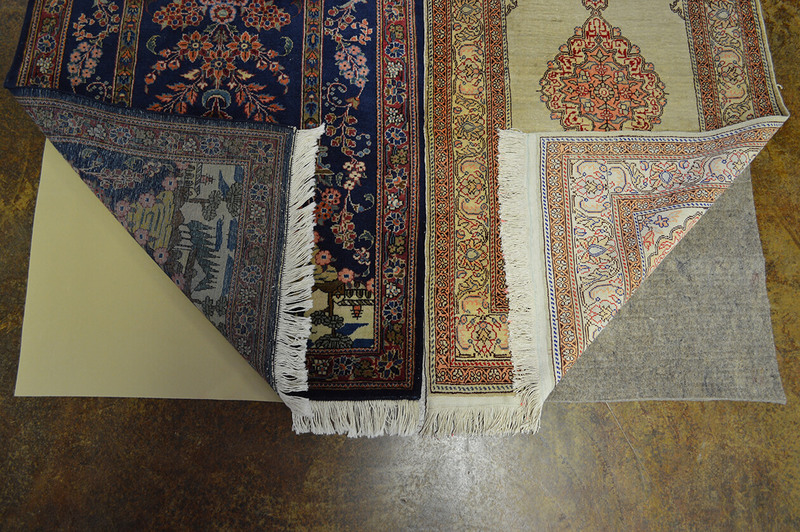 Padding will prevent this, and it will help to extend the life of your rug too. When you walk on a rug with padding installed, it feels softer and more comfortable under your feet. You also won’t have to worry about your rug slipping underneath you and causing an accident- and yes, this CAN happen on carpeted floors, too. Because it can absorb some impact, padding can increase the life of your rug by as much as 40%. The most absorbent type of padding is felt. What Kind of Padding Do I Need? Rug padding materials perform differently based on the material of the rug. Ask us to help you pick the right padding material for your rug. We will also cut the padding to the shape of your rug. For many years, hair and jute based pads were the only varities available. Felt pads are newer, and we recommend this material for most types of rugs. Felt is made of recycled, synthetic materials. Moths will not eat these fibers, and the synthetic fibers of felt are longer lasting than the hair and jute fibers. The firmness and stability of synthetic felt also give it the advantage of being able to eliminate any ripples and bumps that can cause uneven wear when a rug lies on the floor without a pad. To be truly effective, a half inch thick pad is needed. Unfortunately, felt rugs can still slip underneath smaller rugs, even if the padding is dense. For smaller rugs, we recommend purchasing rubber padding. Be careful not to mix rubber padding with sponge or foam padding. We do not recommend sponge or foam padding, as they are too soft and can bottom out- stressing the foundation of Oriental rugs. This is especially applicable to thin, finely woven rugs, flat weaves, or antique rugs. Sponge and foam padding can disintegrate and even stick to wood floors. One of the best types of rug padding on the market is a fourth-inch thick synthetic felt bonded to a thin, solid rubber backing. This type of padding can serve two purpose. First, it is excellent at anchoring the rug to your floor, prevent slipping. Second, its felt layer helps to extend the life of your rug. As previously mentioned, a rug without padding can slide around and cause serious falls and injuries. This type of padding is recommended for all scatter rugs and area rugs that do not have a thick foundation, such as antique rugs, needlepoints, Aubusson tapestries, and flat weaves. Another benefit of this type of padding is that it can also be used on thick rugs. It is thinner than synthetic felt and will not add on to the thickness of your rug. You can even place this padding on top of carpet. It eliminates rippling, buckling, and adjusting, even on wall to wall carpeted areas. Rubber padding on the Left and “Black” padding on the right with vinyl and felt.